The very peak of the NHL card market each year, 2015-16 Upper Deck The Cup Hockey helps put a ribbon on the '15-16 season with one more push for the strong rookie class. Every hobby box includes two autographed patch cards with one being for a first-year player. The traditional base set is numbered to 249 but there are many low-numbered parallels to go with it. This includes Gold Spectrum (1/1) and Black Foil (1/1) along with Gold Foil Auto Patch (#/8), Red Foil Auto Tag (#/4) and Black Foil NHL Shield Auto (1/1). However, the real stars of 2015-16 Upper Deck The Cup Hockey are the Autographed Rookie Patch cards (#/249 or #/99). They too come in a variety of parallels, including Patch Gold Foil (#/24 or #/12) and Red Foil Tag (#/8 or #/4). Adding to that are Rookie Autographs, numbered to 249, with Gold Foil (#/24), Red Foil (#/8) and Black Foil (1/1) parallels. From there is a mass of autographs to chase, including Brilliance Autographs (1:8) and throwback 2005-06 Rookie Tribute autograph relics (#/10). 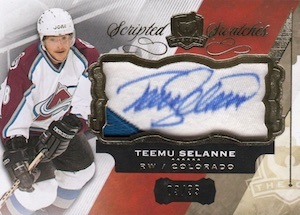 Autographed booklets come as Monumental Sticks (#'d), Pro/Rookie Gear (#/24 or #/12), and Monumental Rookie Patch (#/6). Relic-only booklets include 6-Way (#/48), 9-Way (#/9) and 12-Way Relics (#/24 or #/12). A major insert line in 2015-16 Upper Deck The Cup Hockey, Cup Foundations Quad includes Jersey (#/75), Patch (#/10), Auto Jersey (#/15), Auto Patch (#/5), and Auto Jersey/Patch Tag (1/1) versions for both rookies and veterans. 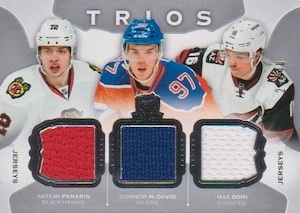 Cup Trios (#/40), Cup Quads (#/25) and Cup Sixes (#/15) offer a base jersey insert as well as Patch (#/10 or less), Tag (#/2) and Button (1/1) parallels. Continuing on, Emblems of Endorsements (#/15) is a familiar insert line along with Enshrinements (#/99 or #/25), which also includes Duos (#/25 or #/10) and Trios (#/10 or #/5). 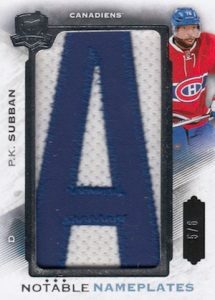 Another UD staple, game-worn Limited Logos inserts are found both unsigned (#/50) and signed (#/50 or less). 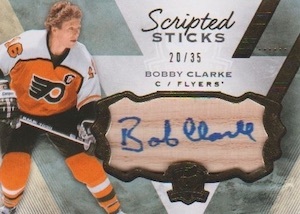 Scripted Sticks (#/35) and Swatches (#/35) bring more relics into play. 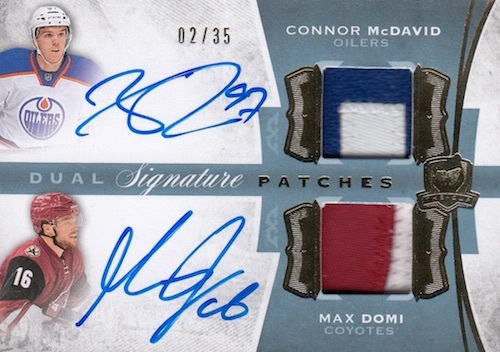 Among the many other appealing autographs in 2015-16 Upper Deck The Cup Hockey are Signature Patches (#/99 or #/25), Signature Renditions (1:7) and Combos (1:100), The Show (1:180), which takes inspiration from UDA memorabilia, and NHL Glory Autos (#/10). Glory also comes in an unsigned version (#/10). Program of Excellence single (#/10) and Dual autographs (#/5) bring more premium goodness to the release. 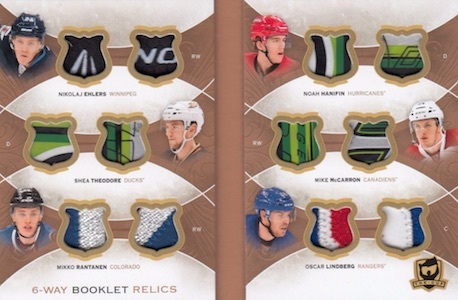 Adding another element to 2015-16 Upper Deck The Cup Hockey is the Exquisite Collection continuation. Options include Exquisite Endorsements Relics (#/50 or less) and Exquisite Rookie Auto Patch (jersey #'d). 100 cards. Serial Numbered #/249. PARALLEL CARDS: Gold Spectrum Foil #/12, Gold Foil Patch #/8, Red Foil Tag #/4, Black Foil 1/1, Black Foil Shield 1/1, Masterpiece Plates 1/1. *Many parallel cards are autographed. All subjects not included in parallels. View specific options with the full spreadsheet. 13 cards. Serial Numbered #/249. PARALLEL CARDS: Gold Spectrum Foil #/36, Gold Foil #/24, Red Foil #/8 (*No cards #104, 107, 112), Black Foil 1/1, Printing Plates 1/1. PARALLEL CARDS: Gold Spectrum Foil #/36 or #/24, Gold Foil #/24 or #/12, Red Foil Tag #/8 or #/4, Black Foil 1/1, Black Foil Shield 1/1. *Jack Eichel cards not signed. All subjects not included in parallels. View specific options with the full spreadsheet. 12 cards. Serial Numbered #/48. *Cards found only in parallels noted below. 5 cards. Serial Numbered #/24. PARALLEL CARDS: Spectrum #/3 or #/6 (*No card #FLYERS). 18 cards. Serial Numbered #/24. 17 cards. Serial Numbered #/6. 19 cards. Overall odds 1:8 packs. Individual group odds noted below. 43 cards. Serial Numbered #/75. *Cards found only in parallels noted below. PARALLEL CARDS: Autograph #/15, Autograph Tag 1/1. 42 cards. Serial Numbered #/10. *Cards found only in parallels noted below. PARALLEL CARDS: Autograph #/5, Autograph Tag 1/1. 44 cards. Serial Numbered #/40. *Cards found only in parallels noted below. 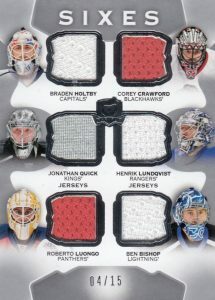 PARALLEL CARDS: Patch #/10 (*No cards #CANES, LW), Tag #/2, Button 1/1. 28 cards. Serial Numbered #/25. *Cards found only in parallels noted below. 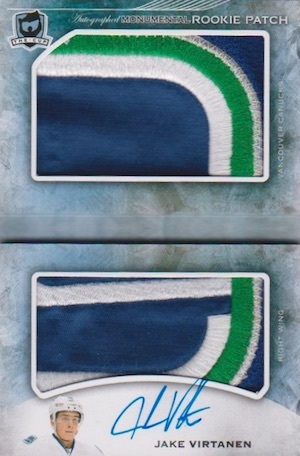 PARALLEL CARDS: Patch #/5, Tag #/2, Button 1/1. 13 cards. Serial Numbered #/15. PARALLEL CARDS: Patch #/3, Tag #/2, Button 1/1. 8 cards. Serial Numbered #/18. 23 cards. Serial Numbered #/15. 45 cards. *Jack Eichel card not signed. 17 cards. Serial Numbered #/10. All cards are for Team Canada. 4 cards. Serial Numbered #/5. All cards are for Team Canada. 26 cards. Serial Numbered #/35. 8 cards. Serial Numbered #/15. 20 cards. Overall odds 1:7 packs. 3 cards. Overall odds 1:100 packs. 16 cards. Specific group odds noted below. 45 cards. *Cards found only in parallels noted below. 14 cards. Serial Numbered #/50. Printing Plates from previous 15-16 NHL products. Serial Numbered 1/1. Shop for 2015-16 Upper Deck The Cup Hockey boxes on eBay. Wow ! I know the cup has a bit of a following but late October is just silly. Not sure why anyone would buy this stuff now but as usual it will likely sell out. Good luck gamblers, I think I’ll just buy a few lottery tickets instead. THESE WILL BE SOME OF THE CAD TO LOOK FOR AT THE UPCOMING SHOW–AS THE CUP WILL NOT BE RELEASED! Here’s a idea finish releasing 15/16 products then release the next year products. I love the cup but I’m getting the feeling this will be highest print run ever for the cup. And the price will be insane. All cause of mcdavid. How can anybody afford a box of this unless you gamble and do group breaks. Taking this long to release a product I would hope there’s no redemption cards. But probally not 2 stars cause UD can’t seem to pull it together once again. Destroying the hobby for us working class folks. Only Trump can afford this product lol. Only 1 card in set I’m interested in really. Lanny McDonald 1/1 stick card. Why in the world do you not have more Lanny cards but have wili piletit cards. To many no name rookies and more stars and hall of famers needed. Epically at that price point. Still wondering with the extra month it’s taking to release the product at this crazy price how many redemptions are there. And so many update cards. We are buying 15/16 cup not 14/15. If you include these update cards they should be as a bonus card in box not count as a regular hit. Or put update cards in every product. So you have a chance to pull a cup card in series 1/2 etc. I would collect it if the price point was 400-500 Canadian. I just can’t justify or afford 700-800 a box for 6 cards. Guess I gotta gamble on a couple group breaks if I dare to spent crazy money. 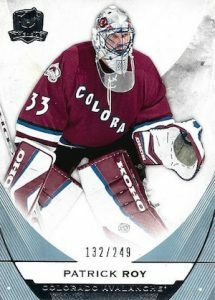 Bring back panini it would cut prices down cause there would be compition and no monopoly on hockey cards. Mouhahaha…What a joke! So inspired about not ordering this. I wanted to buy 3 cases, but after the High-End fiasco of the entire season, I said no thanks. And man, I was right. Insipid checklist and @Dave called it. Huge print ever for the cup. I see the printing plates are included in the checklist. It mean that they will count as a card right? They are not the plates you receive for free I guess. What about the never ending Update list. Absolutely horrible. For 850$ CAD the box this is simply outrageous and disrespectful. But hey, I’m sure people will try their luck. really getting tired of the lack of ottawa senator cards. no karlsson again. really other than a few rookies there no senators whatsoever. I disagree with a lot of the comments. This years The Cup has the best checklist for Rookie Tier 2, and has the best Rookie Tier 1 checklist since 10 years ago. The price is reflected upon this. Do not be surprised if next years price point of The Cup is significantly lower due to the comparisons of both checklists. I was going to give this product 5 stars, but I am not fond of the amount of booklets. @33NHL I don’t know how you came up with the 5000 tins or more. I did some math, and I have a much bigger number. But perhaps I’m wrong. Can anyone else jump in and correct me or confirm my numbers? Just after a quick calculation, 5000 tins means only 835 cases, which seems very low. So, what do people think about these numbers? My friend opened a case. Out of 36 cards, 10 are Base cards #249, 2 Plates, 4 plain Jerseys that hold 0 value, 2 of the RPAs have horrible corners really smashed, one of the RPAs is a black plain cloth, and out of the 7 RPAs he pulled, there’s a double. Now this is the quality I was talking about. But perhaps he was extremely unlucky. What did you pull? UD has even managed to ruin the CUP! I know they are not to blame for the price enhancement going on. However, they are to blame for watering down the most anticipated product of the year. A disaster! They took everyone for a ride without shame this year. So many 2 base card tins and rare is a legend! I think the cards, as always, look great except for 1 huuuuuuuge exception; the rookie auto patch cards. Whomever thought that having the players put their signatures overtop of the wording on the bottom of the card needs to be fired. It destroys the visual appeal of those rookie cards, which are a huge reason why people buy this product. All of the other cards that have autos are fine. I can’t say anything bad about the price point, McDavid speculation drives this product as it should. Qualitywise, anything I’ve seen has been in near perfect shape, no issues with nicks or bad corners. I feel fortunate that in two 3 case randoms I ended up with what amounts to half a box for 20% of the price of a full one(Sakic base, Colorado 3 way jersey and Nicolas Petan 249 redemption). Would never touch a sealed box of this unless it was deeply discounted but don’t see that happening. I completely agree with T.C. Boutique. At $850 canadian a tin unless you are Donald Trump you can’t afford these insane prices. As with every high end product I will do my MC Hammer approach: U can’t touch this! Happy holidays everyone. I was at my Lcs yesterday. A new collector at the counter asked what he should buy. I told him UD S1 is most popular. A young man, no older than 20 picked up a preorder case of the cup. He then cusses out his dad to up the credit card limit and proceeds to buy another case. The new collector asks the staff member how much is the cup and when he found out he looks at me and I say that’s crazy. It is crazy when the hobbyists are silver spoon feed rich kids. I am sure most hobbyists are not like this example and are probably well to do adults living within their means. It’s crazy when a tin of the cup is more than my bi-weekly mortgage and car payment. The hockey card gods are crying. There seems to be an awful lot of redemptions with 11/11/2018 expiration dates in this product, some of which are big cards such as the Legends of Hockey Auto Booklet Messier, Gretzky, Kuri Red #/9. IMHO a product sold at this $$ level shouldn’t have redemptions or if there are redemptions those should not have expiration dates. Can you imagine busting a box at Christmas in 2018 and pulling the aforementioned redemption?? gretzky dual patch in Canadian allstar uniform #d to 15. from Pittsburgh would have liked a murray rookie or any good non tier one rookie. cest la vie. if I get $ 300 for everything else on the bay looking at $ 1650 for two cards. other than hitting a home run guess its okay. Just opened 2 boxes and got a Fabbri rookie auto patch, Fabbri signature patch, Rob Blake Logos, Bennett Enshriments, Hutton rookie auto, Lundqvist patch /8, and base. Really nice looking cards but due to high demand and low supply we are paying through the roof for these cards. High end cards are more desirable and we are paying an higher end price now and with that, there will be more disappointment. On the bright side, for me I only bought 2 boxes so I can still pay my mortgage. I almost fell over to see a case on EBay with the bid at 5000$ Canadian. I opened three boxes so far. My first box I got a Cup Foundations Quad Patch /10 of McDavid, and a two colour RPA of Goldobin. Second box was terrible, absolutely nothing. My third box I got a RPA of McDavid 4/99. So far, so good. For a top-of-the-line product, this leaves a lot to be desired. Quality control is still an issue with UD. 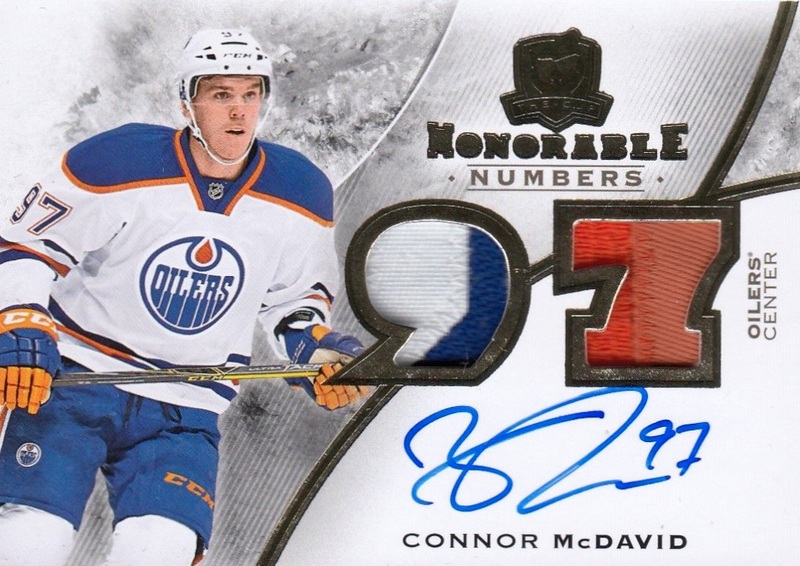 For example, McDavid’s Honourable Numbers/97 have some cards without numbering…that’s inexcusable. There’s still white & black only patches. It’s so hard to pull a top rookie patch, at least have a seam break in each of them. For those Rookies who’ve played games their first season, i.e. many of the top Rookies, why don’t they feature actual game-used jerseys rather than photo shoot pieces? So many printing plates, many from earlier years, taking the place of a current year’s card…geesch! Very disappointing. You know I would rate this a ‘5’ if the price/tin was around $400 Cdn. I think that would be a fair price considering what most tins return in terms of price. I just watched a 3 tin break from an online breaker and after looking up all card sales on ebay, the return on tins was the following. That comes out to a return of $780 !!! Let’s say avg price/tin in Canada is $799 so a 3 tin case cost you $2397 !! You might as well take that $2397, go to ebay and buy yourself a high-end McDavid card from any of the other releases this year. Actually, even with the Cup, you can get a nice McD card for that price. I know…it’s not the same as risking all your money for the thrill of the hit but when you hit nothing, the buyers remorse is like a swift kick in the walnuts. I love the Cup as a collector and it looks like more and more of us are being pushed to the sidelines to buy in the secondary market. I guess that is fine when you see the majority of people liquidating on ebay for super cheap prices. My other issue is with the greedy distributors and hobby shops. Come on..all breaks started at about $155 Cdn to be in a random 6 box case break. Multiple that $155 x 30 teams and the breakers pull in $4650/case. Any ideas on the hobby shop cost/case to start with? Let’s say they got it for $400/tin or $2400/case. That would mean each break is bringing in $2K Cdn to the breakers minus shipping costs & their time. I mean…come on. Now the breaks are up to $175 Cdn for a 6 box random so now the breakers make $5250/6 tin case break minus their costs which to be fair let’s say it cost them $500/tin or $6000/case. They are still pulling in over $2k profit in each break. Sorry…but when you treat your customers with a garbage returns like this, you will get what is coming to you in the form of lost business and sales. Everyone needs to make money but how much is enough? Better hope you hit a /99 rookie or other low probability hit card b/c otherwise you are getting a bar of soap, in a pillowcase, to the head. Really…the only return is hitting a McDavid & we all know the chances on that. I will compliment UD on the cards though. Beautiful, great quality & probably the lowest amount of redemptions I have seen yet. I will crucify UD on the point of ‘EVENT USED’ vs ‘Game Used’ though. What a joke. You want collectors to dish out $700+ Cdn for a bunch of non-gamed used patches in your HIGHEST end product. Ya….so you have game used in the limited logos. So what? Happy collecting & good luck to those that buy the Cup. 2015 16 Upper Deck The Cup Hockey Box-Poss: Connor McDavid?